When you consult with Colonial Tool Group, you're gaining access to premier machine spindle repair that you'll struggle to find with other competitors. We prioritize high quality above all else, and with that comes quick spindle repair service and efficient labor. Spindles are the heart of all kinds of popular CNC machinery and other production tools, including lathes, mills and grinders. Naturally, the importance of spindles in manufacturing means that spindle repair is critical to the success of most production processes. We understand the importance of their functionality, and that's why we offer 24/7 service for your needs. When you come to Colonial Tool Group for spindle repair, we'll put your tools through our 19-step process to pinpoint their issues and find appropriate solutions. With our quick spindle repair turnaround times, you'll gain a host of benefits that go beyond the immediate repairs. Minimize downtime: When spindles cease to operate as needed, your machines can experience serious operational issues. They might slow down or, in the worst-case scenario, become totally inoperable and present a danger to run. By trusting us to fix your spindles, your machines will be back up and running at full capacity as needed. Your production won't lag too far behind your quota, and you won't lose any more money than you need to. Lower operational costs: A broken or warped spindle might not immediately show itself. Your machine will often still run, but eventually, it will become apparent that something in the process is off-kilter. A significantly slower and less-efficient device means higher operating costs and reduced production, which can hamper any successful business. We'll replace every malfunctioning component of your spindle with the best available parts, returning your production cycle to peak performance. Best product for the cost: When we implement our focused methods for repairing and rebuilding spindles, it's meant to fix them and keep them fixed for a long time. We'll provide a detailed report of our findings, which will offer the best costs for solutions. We won't move forward with any repair or rebuild until after you give your approval. While Colonial Tool has built a strong reputation on providing reliable new spindles for our customers, we have also earned our stars and banners as being a total solution house. For our customers, this means being a leading spindle repair shop in Michigan and providing specific knowledge on spindle motor repairs, as well as specialized lathe and CNC spindle repairs. When it comes to the repairing and rebuilding of virtually any type of precision spindle, regardless of the manufacturer, our in-house capabilities with modern, state-of-the-art equipment, combined with the accumulated expertise of our people, are decisive factors that will give you the confidence and assurance of a job well done. Try us for your next CNC machine spindle repair or rebuild, and we bet you’ll be hooked by our quality and turnaround time. We know every minute of unplanned downtime costs your business money, so we work fast to provide top-quality high-speed spindle repair that gets your machines running again. On top of our unbeatable spindle repair capabilities, we can also help you plan regular inspection and maintenance of your CNC spindles to avoid costly breakdowns. Enjoy these and other benefits of turning to Colonial Tool for all of your machine tool spindle repairs. These are just some of Colonial Tool's satisfied spindle repair customers: Ford, GM, Chrysler, CAT, Cummins, MAG, Comau, Ingersoll Production Equipment, Linamar, Red Viking, Raven Engineering, Cell Con, large and small machine houses and die shops. We have the experience and knowledge to help customers of all sizes get the most out of their CNC machine tool spindles. You invest a lot of money in your machine tools and spindles and want to get a healthy return on your investment. When we repair and rebuild your spindles, we help you get more hours out of them and extend their useful life. You don’t have to worry about out-of-tolerance or unreliable repaired spindles. We return your spindles to like-new condition or better. Rebuilt spindles are guaranteed for one year from shipment and require the same care as a new spindle. Spindle motor repairs are managed on a case-by-case basis and allow us to provide you with the best machinery and precision available on the market. We thoroughly review the engineering and construction of all CNC machine spindle repairs. We’re not satisfied to simply repair your spindles, however. Before we return your spindles to you, we ensure they have been tested and balanced so you can put them back to work right away and avoid more costly downtime. Our rebuilt spindles perform like they did when they were new and cost you significantly less than buying brand new ones. You’ll quickly see the difference in your bottom line, especially when you see the improvement on your price-per-piece calculations. To guarantee consistency in your rebuilt machine tool spindles, we are consistent in how we repair them. Our trained repair specialists take the time to do a complete and thorough analysis of your spindles when we receive them to plan the best course of action. Our 19-point checklist ensures every high-speed CNC spindle repair is performed to the same methodical standards so your spindles are ready to put back to work right away. Here’s how we handle every single spindle repair. Specialty, standard, OEM-specific and completely custom jobs all receive our same excellent standard of care. 7. Check motor windings, and internal thermistors with OHMS gauge, and meager, (if it is a motorized spindle). 10. Check shaft out complete with measuring bearings journals, shoulder, face, and pilot run outs, and pulley run outs. 18. Inspect final run outs as listed above, after run in is completed. Thanks to our experience and well-equipped facility, we can perform all of these steps quickly to give you a fast turnaround time while maintaining top-quality repairs. Every step in our machine tool spindle repair, CNC spindle repair, high-speed spindle repair, lathe spindle repair and spindle motor repairs are well-documented so you’ll understand what we do and so we can quickly audit our process to prevent harm to your operations. All machine spindle repairs follow these steps and are fully reviewed before they come back to you. We’ve spent decades here at Colonial Tool helping businesses of all sizes keep their CNC machines running reliably. We’re proud to be a leading tooling specialist and offer a wide range of rebuild and repair services to customers across the U.S. If you have worn or broken spindles that are in need of attention, contact us today. One of our tooling repair experts will get back to you and let you know what we can do to repair your high-speed spindles so you can put them back to work earning you money. Don’t trust your valuable machine spindle repair job to just any company. Trust Colonial Tool, the industry leader in these services, and rest assured your spindles are in good hands. We’ve built our reputation on creating value with your broken spindles, so come and take advantage of our expert machine tool repair and rebuild services today! Colonial Tool precision spindles (formally EX-CELL-O precision spindles) have been providing significant operational efficiency and lifetime savings for our customers. We took this engineering knowledge and have turned our shop into one of the most competent repair services for our customers for over 80 years. R.A.S. can provide 24-hour, in-house manufacturing and repair spindle personnel to expedite fast, efficient and competent spindle repairs for your emergency situation. Our experts repair spindles of any operational function with the specific characteristics that you need, even in high-demand requests such as CNC spindle repairs. Colonial Tool has all the necessary equipment and expertise to service and/or repair any precision spindle on the market today. We know the best practices and engineering principles industry-leading OEMs use, and can replicate or repair your spindles to meet those exacting criteria. Need a machine spindle repair in Guelph, Stratford, Ingersoll, New Hamburg, or throughout Ontario and Michigan? You’ve come to the right place. Contact us, get your quote and ship your spindle to us whenever you’re ready for repairs. And if you’re having an emergency? Colonial Tool will send a service engineer to the customer's facility when time constraints do not allow the return of the spindle to Colonial Tool. R.A.S. service is the foundation of our business, which leads to satisﬁed customers. For our American customers, we have a U.S. drop-off point in Detroit. R.A.S.' Customs department generates the paperwork necessary to bring the spindles into Canada for repair. A job number is assigned to the spindle and priority assigned based on customer needs. R.A.S. assigns a suffix-“R” to the job numbers of warranty repairs to highlight first priority and assignment of an engineer to coordinate the testing and failure analysis. 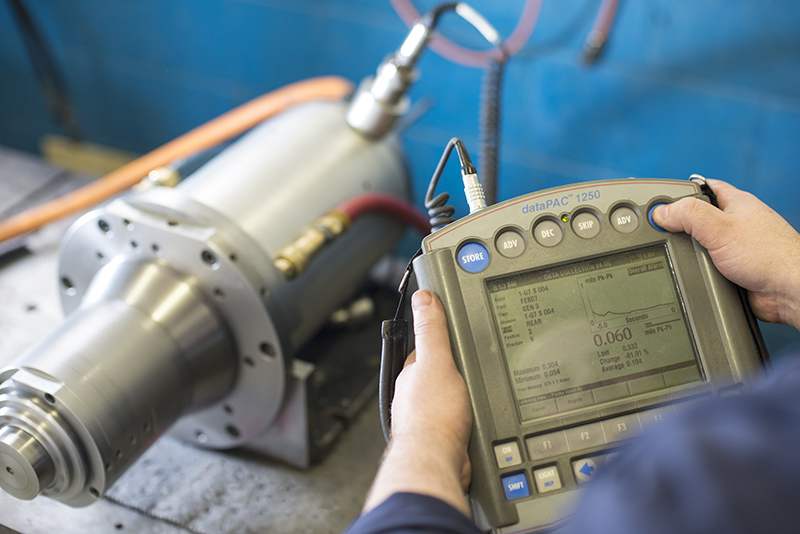 Each spindle is given a thorough visual inspection by the spindle service technician to determine degree of failure, by this procedure, namely whether contamination, motor problems, machine impact and possible damage to the spindle envelope. This allows us to start to understand the damage and initiate proper testing and controls for your high-speed spindle repair. Information is gained by performing service checks with a tenth indicator. Pilot and face TIR runout tests are performed as well as radial load, axial compliance, thermal and axis of rotation tests. Machine tool spindle repair requires precision in the knowledge we gain, which is why Colonial Tool employs some of the best engineers and technicians in Canada. The service technician, working with assembly prints, stock lists and all detail component prints carefully disassembles the precision spindle, making notes on any problems that are found (warranty spindles require engineer observation during this process). Bearings are stored, in sets, within Zip—Lock plastic bags for further inspection if necessary. Our machine spindle repairs come with a full inventory and audit of the components. All components, excluding bearings, are thoroughly cleaned of all foreign substances. Some details may require vapour and/or bead blasting to remove any deposits and then are re-washed and blown dry. We adhere to warranty requirements and industry best practices for your industry, ensuring that your CNC spindle repair or other spindle needs are met, and that units are properly kept in compliance with your needs. All component details are inspected against their print tolerances and deviations are noted on the "Spindle Repair Report". Shaft bearing diameters are accurately inspected for roundness; the face, pilot and bearing shoulder are inspected for TIR runout. Bodies are inspected for size, ovality and taper of the bores as well as concentricity of front to back bores are inspected. By this point, the R.A.S. service personnel will have an understanding of why the spindle failed. A description of probable spindle failure is noted by the R.A.S. service technician on the spindle repair report. This report is generated and referenced throughout (for example) the lathe spindle repair process. This ensures we manage each repair or part replacement properly. We have a full suite of tests to confirm success before returning the spindle to you. Engineering is contacted when the service technician feels that the failure may be due to design flaws and it is the responsibility of engineering to outline improvements. Machine tool spindle repair specialist engineers have seen failures of almost every kind, and have developed a standard practice to create solutions and verify these elements. A formal quotation is generated and a “not to exceed” price is presented to the customer for approval prior to reworking the spindle. Components not within original print tolerances are reworked or replaced (i.e. chroming shafts, sleeving housings). Rotating components are checked for compliance to balance specifications and rebalanced if necessary. Dimensions of all geometric inspections are performed to reworked features and documented to ensure quality. Assembly of the spindle is comprised of ensuring dimensional integrity of the assembly maintaining pertinent datums and testing the spindle. The testing of the spindle is complete in accordance to the procedures listed in sections VI.A.5 and VI.B.1 through 3. The spindles are labelled with important information concerning style, speed and lubrication. Once this is complete, painting of the housing is performed to resist corrosion. Machine spindle repairs and rebuilt spindles are guaranteed for one year from shipment and require the same care as a new spindle. Prior to packaging the spindle, a coating of protective oil is placed on machined surfaces to prevent spindles from corroding. Spindles that incorporate liquid cooling should be purged of the cooling medium and replaced with antifreeze during cold temperatures to ensure the housing from cracking. The spindles are packaged in a wooden box lined with a 1/2 inch thick vibration dampening material which prevents transit vibration from brinnelling the bearings. R.A.S. recommends that the spindle remain in this container until being put in production. We’ve used these steps to become a spindle repair leader in Ontario, as well as in our southern practice areas, including spindle repair in Michigan. Colonial Tool is your one-stop shop for spindle inspection, maintenance, repair and more. Contact us now to start the process and learn more about the machining, spindle repairs and custom work we provide.